The Apostle Herodion, whom Saint Paul mentions in his Epistle to the Romans (16:11) and calls his "kinsman," was ordained presbyter and then Bishop of New Patras, where he was slain by Jews and pagans. Saint Agabus is mentioned in Acts 21:10-11, where he prophesied Saint Paul's arrest in Jerusalem at the hands of the Jewish leaders. In Acts 11:27-28 it is mentioned also that this Saint foretold the great famine that would come to pass in the time of Claudius Caesar. Having preached the Gospel throughout various regions, he departed to the Lord. The Apostle Rufus became Bishop of Thebes in Greece. The Apostles Asyncritus and Phlegon preached Christ in many places, suffered many afflictions at the hands of the pagans and Jews, and departed unto the Lord. The Apostle Hermes is mentioned with them in the Epistle to the Romans (16:13-14). 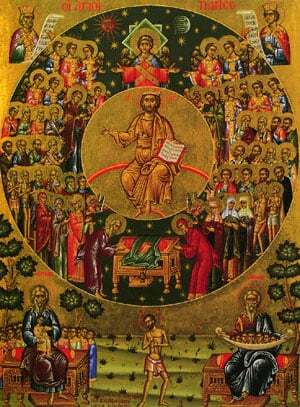 Share the feast of The Holy Apostles of the Seventy Herodion, Agabus, Rufus, Asyncritus, Phlegon, and Hermes with an icon greeting ecard.